Some of the major problems facing Cubans today seem, at first glance, to be of a monetary nature. High prices in relation to salaries and a dual currency/dual exchange rate system appear to be sources of difficulties. While lack of purchasing power is ultimately caused by basic structures of the Cuban economy, monetary policy decisions play an important role and have the power to influence these problems as well. As a centrally planned economy, Cuba’s monetary policy plays a different role than in market economies. The Central Bank itself lists the two main instruments of its monetary policy as “controls over exchange rates and legal reserve ratios” (www.bc.gov.cu). 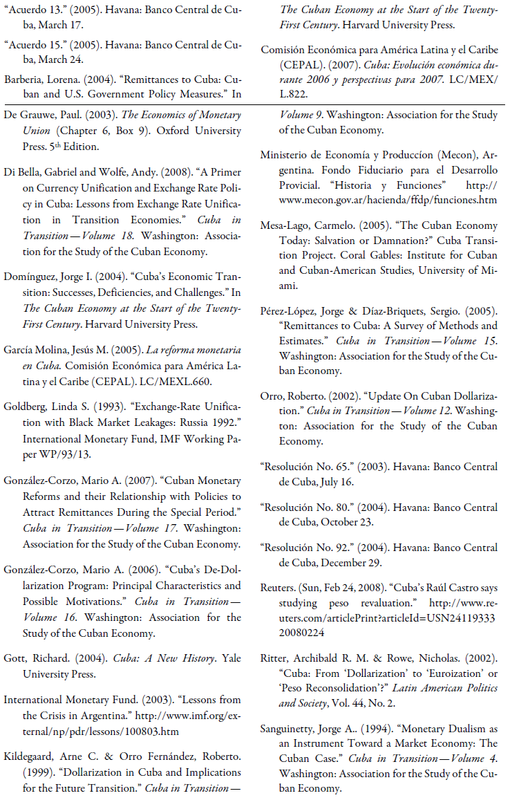 This paper first gives a short history of Cuban monetary policy since the fall of the Soviet Union and presents the current situation. It then presents problems of the current multiple currency system, and draws parallels between the Cuban case and three other (former) multiple currency areas—Argentina, the Eurozone, and Russia—and those areas’ policy decisions. Finally, this analysis is followed by a prognosis for Cuba’s monetary policy for the near future. Cuba currently operates under a dual-currency system. The two official currencies in circulation are the peso (moneda nacional, MN or CUP) and the convertible peso (CUC). The latter was originally designed to replace the U.S. dollar in the economy at a 1:1 rate. The Cuban peso was created in 1915, at which time the U.S. dollar was also legal tender on the island (Gott 2004, Sanguinetty 1994). With the creation of the Banco Nacional de Cuba in 1950, the peso became the only legal currency, and remained so until 1993 (Sanguinetty 1994). Throughout the 1980s, the Cuban government expanded its network of so-called dollar stores for foreigners. These had been originated in Havana in 1979, designed for visiting U.S. family members to buy things in lieu of sending care packages, which were seen as a bomb threat (Gott 2004). They were based on the foreign embassy diplotiendas serving diplomats (Barberia 2004). As a result of growing inflation due to monetary overhang and scarcity of goods following the fall of the Soviet Union, demand for U.S. dollars grew on the black market. In 1993, legalization of the dollar took place. The dollar now circulated in addition to the peso, and could be held by Cuban citizens officially, rather than just obtained through the black market. Cubans could now legally make purchases in the government dollar stores (Barberia 2004). The peso still remained in use for government salaries, rationed purchases and internal government transactions. In 1994, the convertible peso was introduced. This two-currency system was originally introduced as a temporary measure whereby “the two pesos would be unified once the economy allowed” (Fidel Castro quoted by Reuters). Following 1994 reforms by the government to reduce excess demand, appreciation of the peso was achieved, and since then there has been relative monetary stability (see Figure 1). The dollar, however, remained as the favored means of payment and store of value. Though already introduced in 1994, the CUC gained its current status as the only official circulating currency alongside the peso starting in 2003, when the Banco Central de Cuba (BCC), created in 1997, passed Resolution No. 65 on July 16. According to this resolution, the CUC was to replace the U.S. dollar everywhere it was in use, all dollar holdings of Cuban enterprises were to be converted to CUCs, any excess foreign currency was to be sold to the central bank, and a service fee ranging between 1% and 2% was put in place for any foreign exchange transactions by state firms. This measure was followed by Resolution No. 80 of the BCC on October 23, 2004, by which dollars could still be held by the population, but would no longer be accepted as a means of payment, and a 10% conversion charge (gravamen) on dollars (but not other foreign currencies) would be in place after November 8, 2004. New U.S. dollar deposits would also no longer be accepted by Cuban banks, though existing accounts and withdrawals from them would be exempted from the 10% charge. Incidentally, Euros also continue to be accepted in certain tourist areas (Resolution No. 80). The government had made some attempt to euroize the dollar sector, discussing this option openly between 1999 and 2001 (Ritter & Rowe 2002, p. 111), but later gave up this course of action. Beginning in 2000, after Cuba’s acceptance into the Africa, Caribbean and Pacific (ACP) Group of States, relations with the European Union became strained. ACP membership is a first step towards eligibility for development aid from the EU through the Cotonou Accord. However, the EU took steps to block Cuba’s entrance into the Accord on the grounds of the country’s repression of dissidents. The interaction between Cuba and the EU culminated in Castro breaking off relations with all EU embassies, though relations were normalized in 2005 (Mesa-Lago 2005). This situation certainly played a role in the decision to place less emphasis on the euro. Another factor was the popularity of the dollar, and the fact that most remittances to Cuba come in the form of U.S. dollars. The measures mentioned above were followed up with Resolution No. 92 of the BCC on December 29, 2004, which mandated the centralization at the BCC of all foreign exchange transactions, including those by government ministries. On March 17, 2005, Agreement 13 BCC set the new exchange rate at 24MN/CUC sold, 25MN/CUC bought. This represented an increase in value for the peso, which had formerly been exchanged for 26MN/CUC when sold and 27MN/ CUC when bought at state-run Casas de Cambio (CADECA). Agreement 15 BCC of March 24, 2005 changed the U.S. dollar exchange rate to $1.08/1CUC (prior $1/1CUC). Thus, the effective exchange rate including the 10% service charge is presently $0.83/ 1CUC. Finally, the official exchange rate between the peso (MN) and the convertible peso (CUC) to be used by Cuban enterprises remains at 1:1 and the MN/USD rate is 0.9259MN/$1. This rate is only for accounting purposes of enterprises dealing with foreign exchange transactions (http://www.bc.gov.cu/Espanol/tipo_ cambio.asp), and stands in contrast to the relevant rate for personal transactions which is the one set by Agreement 13 BCC. The two sets of exchange rates are summarized in Table 1. At present, there are de facto two economies relying on the two currencies. One is the peso sector, which is made up of government-paid salaries, purchases on the ration system, and use of the official 1 peso/1 CUC exchange rate internally in state enterprises. The other is the tourism, “dollar store,” and foreign investment sector. In spite of this segmentation, there is overlap between the two economies, with most citizens holding both pesos and CUCs. Apart from actual prices, there is the psychological issue of the divide between those who have access to CUCs and those who do not. While the two-currency system is not the root cause of inequalities, it serves to illustrate them. 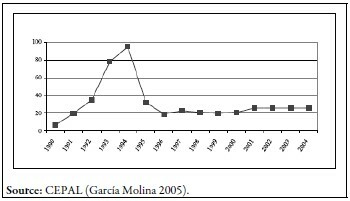 From its introduction in 1994 until 2004, the convertible peso effectively functioned as a currency board, backed completely by foreign currency reserves (Barberia 2004; García Molina 2005, p. 7). After its promotion to sole successor of the dollar through Resolution No. 80, adding the 10% dollar conversion fee, it became the main official currency for international transactions. The commission is justified as “compensation for the costs and risks” (Resolution 80) associated with handling the dollar, and Fidel Castro has stated that revenue generated this way will only be used to support the CUC (Mesa-Lago 2005, p. 33). The decision to de-dollarize came in the wake of the discovery by the U.S. government that Swiss bank UBS had been accepting deposits from the Cuban government for seven years while hiding this fact from the Federal Reserve Bank of New York, which fined UBS as a result (Mesa-Lago 2005). The BCC cites U.S. government pressure on foreign banks and the hindrance of Cuba’s financial activity abroad as a justification for the new measures (Resolution No. 80). The two-currency system causes a number of problems in the economy. The system creates an artificial division between the two sectors. This interferes with efficient resource allocation within the whole economy by distorting prices and incomes, for example providing an incentive for professionals to leave peso-salary jobs for better-paying tourism related work. Whether currency unification alone would eliminate this problem, though, is questionable, since the division between subsidized (rationed) goods and state salaries on the one hand, and “dollar store” goods and tourism-affected earnings on the other would remain. Monetary dualism also creates an opaque environment which invites rent-seeking behavior. Monetary unification could perhaps promote economic integration among the two Cuban economies though efficiency gains, less uncertainty, and greater price clarity. Finally, adding to complications is the dual exchange rate policy with the unrealistic official 1:1 peso/CUC rate. It presents a major problem for export industries. Prices are distorted through this policy, impacting export sectors which receive pesos converted at the official exchange rate for its foreign currency earnings, making an industry seem less profitable than it is. The sugar industry, for example, receives earnings for its exports converted at par, but must purchase many inputs in dollars. This policy, combined with a large disinvestment by the government, has helped to nearly bankrupt the sugar industry (Domínguez 2004). The current dual currency system benefits the government by providing a source of foreign exchange reserves, and offering better oversight of the monetary situation through centralization of foreign exchange transactions. The government is in great need of hard currency due to its large external debts and lack of credit opportunities (Mesa-Lago 2005, p. 35). The Cuban peso, meanwhile, can still be used in dealing with and absorbing negative external shocks. Government- controlled salaries (about 80% of workers are officially state-employed (CEPAL)), paid in pesos,3 can be adjusted, and the government has no dollar-debts domestically. When Cuban citizens receive dollars, be it from tourists or through remittances, they must be converted to CUCs at a 10% fee. This is a substantial source of income for the government. Remittances, for instance, are one of the largest sources of foreign exchange (Barberia 2004), though estimates of the exact amount vary (see Pérez-López & Díaz-Briquets 2005). Of course, government expenditures are mainly in non-convertible Cuban pesos (MN). An additional benefit for the government of its dual currency, dual exchange rate policy is the ability of the state to derive a subsidy from any dollar (or other foreign exchange) payments to its citizens by foreign entities. For instance, foreign corporations wishing to hire Cuban workers must do so through the state employment agency, paying the agency in dollars, while the Cuban government, in turn, pays the hired workers in nonconvertible pesos (MN) (Orro 2002). Similar arrangements are applied to many of the salaries paid to doctors, teachers or soldiers employed abroad. This policy is actually a much larger source of income per dollar transacted for the government than the 10% fee. It is equivalent roughly to a 96% tax (1/25*100= 4% that goes to the employee; the other 96% goes to the government). In sum, the measures surrounding de-dollarization have generated income for the Cuban government by way of the 10% fee and the de-facto 96% tax on foreign- employed workers, and offered greater control of the monetary situation through a return to centralization of foreign exchange transactions. While dollarization could be described as a monetary stability measure, de-dollarization was a fiscal and political decision. The government has repeatedly stated that currency unification is its eventual goal. In 2005, following an increase in dollar store prices, the introduction of the 10% gravamen, and the 8% appreciation of the CUC, all measures which reduced the purchasing power of the dollar in Cuba, the government stated that monetary unification would be achieved through appreciation of the peso (MN) (García Molina 2005, p. 13). Experiences in other (former) multiple currency and/ or multiple exchange rate areas may offer insights into the Cuban monetary situation. When the time comes for monetary transition in Cuba, unification plans used by other countries may serve as a model. One example is Argentina during its crisis of 2001 and in the aftermath. In 2001, following a continuing deterioration of the national fiscal and economic situation, various provinces and the national government began to issue debt which de-facto functioned as currency. At the height of this behavior, such quasi-money made up about 40 percent of the means of payment nationwide (Di Bella & Wolfe 2008; Mecon). These alternate forms of currency were eliminated when the national government bought them up on a 1:1 basis for national currency. Argentina also briefly ran a dual exchange rate regime from January to February 2002, with a fixed rate for public-sector and trade-related transactions (1.4 Pesos/ Dollar) and market rates for all other transactions. On February 11, 2002, the dual exchange rate system was abolished and the currency allowed to float (depreciation to 1.8 Pesos/Dollar). There was also “widespread dollarization of assets and liabilities” (IMF 2003, p.34). Were a buy-up to take place in Cuba, the central issue would be the unification exchange rates. While there is no reliable information on the BCC balance sheet since 2004, it is safe to assume that such a buy-up, even at the CADECA rates, is currently unaffordable. Were a substantial new source of income to materialize, for example if the search for oil in the gulf were to pan out, a buy-up would be an option. Di Bella and Wolfe (2008) estimate that current international reserve coverage of a new monetary base, unified using the current CADECA MN/CUC rate and the official CUC/ USD rate, would be close to 90%. Another example of successful monetary unification can be found in the European Union, where transition to monetary union took place with the use of future fixed conversion rates. Conversion rates for the 1 January 1999 unification were announced approximately six months in advance, while the currencies continued to be traded freely on the market. As the set conversion rates were perceived to be credible, market activity drove the currencies toward their announced rates (De Grauwe 2003 based on Mussa 1979). If the newly created currency (or the re-vamped peso) is perceived to be permanent and stable into the future, it is thinkable that both the CUC and the peso could be made freely tradable inside Cuba. (Neither is truly convertible at present, in the sense of being freely tradable internationally.) At a national level, something similar to the self-fulfilling prophecy of the Euro rates could occur as people adjusted their holdings of CUCs and pesos in preparation for the new unified currency. A final example is Russia, which unified its former multiple exchange rate regime in 1992. Russia had previously had multiple fixed rates which applied to the respective foreign exchange surrender requirements for different types of export earnings, and also to centralized imports. In addition, the interbank market exchange rate, traded on the Moscow Currency Exchange, also applied to some portion of foreign earnings. Unification took place through the devaluation of the former fixed rates in use for various purposes to come into line with the more depreciated, floating interbank rate. The unification “sharply reduced the taxation of export earnings that previously had been imposed though unfavorable exchange rates applied to surrendered foreign exchange” (Goldberg 1993, p. 2). Because the new official exchange rate regime was less distorting, it promoted both an increase in the volume of trade and an increase in legal foreign currency transactions as opposed to black market transactions. The same would hold true for Cuban currency unification. Cuba’s multiple currency, multiple exchange rate system involves a complex and distorted accounting system. It is unpopular within Cuba as symbol of inequalities, and the government has stated that it wishes to unify the currencies eventually. In order for this to happen, though, Cuba will either have to: (1) experience such an economic crisis that, as in 1994, it is forced to implement economic reforms; and/or (2) secure a major new source of income, such as the muchsearched- for oil deposits in the Gulf of Mexico or through the perennially-debated lifting of the U.S. trade embargo. Otherwise, the Cuban government does not have enough of an economic incentive to abolish the current dual system, in spite of its flaws. Indeed, it may be economically unable to do so in absence of these circumstances. Were such a favorable situation to arise, two main issues remain to be resolved for any unification scheme. First, the unification exchange rate between the peso and the CUC must be set, taking into account the desired level of international reserve coverage. Second, there must be a decision on either a “fixed” or a “floating” exchange rate system. The current Cuban government has made clear that it will not accept any solution which involves depreciation of the peso (MN). Therefore, in order for any unified monetary regime to be adopted in the near future, it must satisfy a limited set of economic circumstances. Since the fiscal constraints of the current Cuban economy present a major problem for the viability of any new exchange rate regime, unification of the currency and the exchange rate regimes seems unlikely. 1. Editor’s Note: This essay was awarded First Prize in the ASCE 2009 Student Prize Competition for undergraduate students. 2. I would like to thank Dr. Roger Betancourt, University of Maryland, for being kind enough to meet with me and for pointing me in the right direction. 3. Exception: Some CUC-sector workers receive some part of compensation, such as tips, in CUCs.